So, what do you think of India? 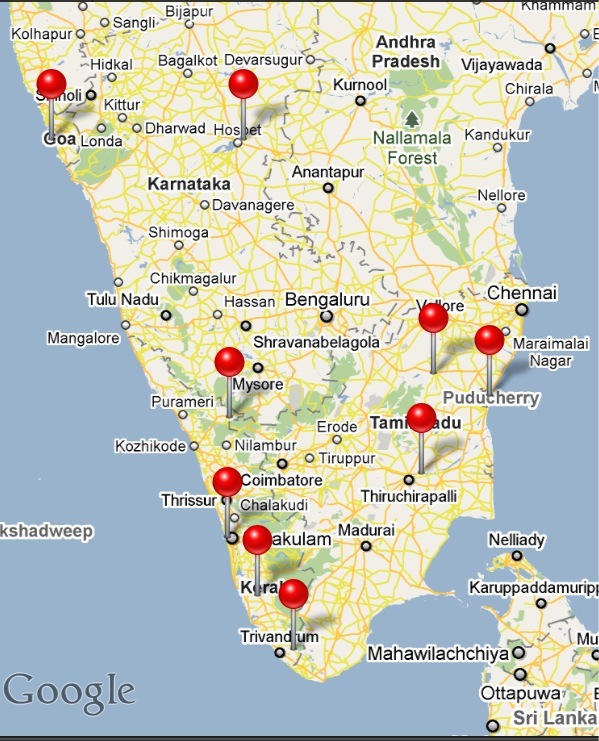 Let’s start with the disclaimers: I’ve spent ‘only’ 7 weeks in India divided over roughly 10 locations in the south (heavily influenced by the Portugese, French, Dutch and obviously the Brits). I skipped the big cities and tourist traps like the Taj Mahal during my stopover in Delhi. My meaningful interactions with ‘locals’ have, unfortunately, mostly been with westernized Indians, as in the south it’s difficult to escape the tourist trail (or I looked in the wrong places). India: you love it or you hate it. And I do neither. I’ve met great people, seen fantastic things, spend an enlightening time in a monastery, ate some of the best fish ever, while spending approximately 30 euro/day including flights in and out. However, India’s culture of indifference isn’t for me. Outside touristic areas people hardly speak English, and the multitude of languages, dialects and heavy accents make it hardly worth the effort of mastering one. Like everywhere in Asia, travel is a pain, but except for one gruesome 20hr trip it has been relatively smooth. Haggling starts to get on my nerves, but I guess I’d better get used to it. Fortunately, I haven’t had a serious case of ‘Delhi Belly’, despite eating almost everything everywhere (except on trains and busses). This was only my first visit to India and I’ll definitely return to see the north. Tomorrow I’ll leave India for Cambodia, which will be a very different experience. Not only is this country still hounted by its gruesome past, but I’ll be finally reunited with Taina as well. With two months allotted to India and the ambition to travel little in order to see places in depth, I thought it was logical to spend some time in a monastery. After almost a week of intense yoga training in a mini-resort (and 3 days recovery at the beach afterwards), I believed I was ready to enter. Even before I entered I lost my first karma points as my rickshaw brutally disrupted the evening prayers. The ‘Delhi Belly’ the following morning could have been interpreted as a bad omen, but wasn’t. Before I continue, I’d better explain the reason I wanted to go. After visiting Birma two years ago and spending a magical night in a monastery (think: get woken up by the singing young monks next door at 05.00 in the morning) I decided back in Amsterdam to follow a weekend introduction course into Buddhism and meditation. I liked it a lot, and like most people I never gave it any attention afterwards. ‘Oh my god, I signed up to stay with some Hare Krishna sect’ was my first thought as my eyes scanned the room for the nearest exit. As I did this I saw (again) normal looking people who were quietly meditating or singing along. I decided in that split second that I would give it a shot, as these vegetarians very probably wouldn’t hurt me. I ended up staying 4 days in the monastery and liking it a lot. The schedule was gruesomely tiring, my body is not intended for yoga, requesting an ‘exit pass’ if you want to leave the monastery grounds for 5 minutes scares the hell out of me, even an loosely and friendly organized religion like Hinduism has no appeal to me whatsoever. So why did I like it so much? The other guests were absolutely great, parts of my body that have been stiff like rock suddenly became flexible, it’s probably the best organized place in India, they organized an excursion where we drove in a big tour bus with loads of people and I loved it (!?! ), the location is amazing, their approach to religion is devoid of any extremism and passion. To my own massive surprise I actually *liked* the singing and found myself humming the songs outside the class. Will I ever dance barefoot in the Kalverstraat (Amsterdam’s main shopping street) with my friends, in an orange dress happily drumming and chanting like there is no tomorrow? Unlikely. But I have learned a lot about religion. My body ached and my mind was tired, so I left, but certain to return to this monastery or another one for another long visit. I guess the width of the beach is about 25 meters and it’s only three meters from the shoreline to the palm trees behind me. But I enjoy having this beach to myself and quietly read a light book about India (Holy cow). Surprisingly, the locals sail a boat that consists of three loosely attached wooden poles that seemed terribly inefficient as it didn’t have a sharp, pointed hull. I supposed that the possibility of detaching them and be able to easily carry them up the beach outweighed the benefits of actually getting somewhere quickly with the boat. I was proven wrong once again. When I was about to leave a local fisherman walked up and we started chatting about the type of fish he catches (small ones), the size of his net (1 km), and what they do with the fish (eat them with tea). Quickly afterwards his friend joined him and they pulled the boat into the water. 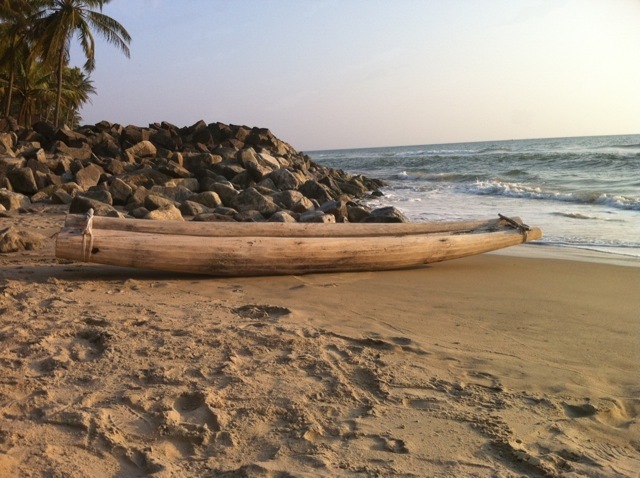 The small size of the boat proved to be a big asset for navigating the big waves close to the shore, the fishing nets fitted like a glove between the two outer wooden poles. 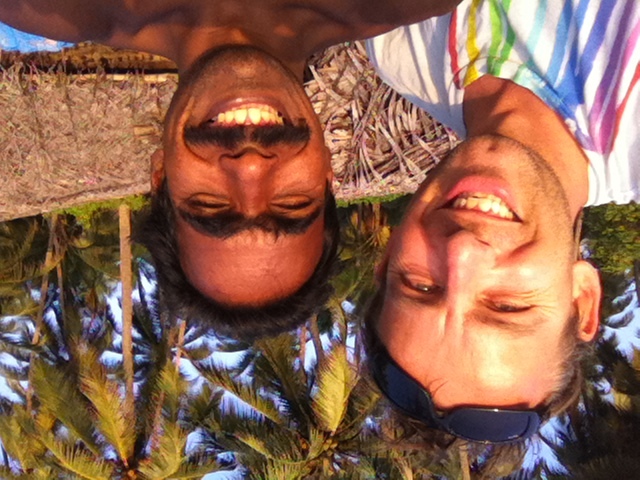 Combined with the skill of the two men it made being a fisherman in South India seem easy. This morning I joined a yoga class. The ticket seller ensured me it was for beginners and the two Russian ladies who were present confirmed it was only their second lesson. After a couple of minutes, the teacher asked us to sit cross-legged, a position I’m unable to maintain for more than a minute. He ensured we sat up straight (otherwise the position wouldn’t ‘work’). He then spoke and demonstrated the position at the same time. Move your hands uuuup and then slooowly move your body forward and touch the floor with your head. I must have looked stunned as he smilingly returned to the sitting position and nodded for me to start repeating his example. I sighed and stretched my arms upward and barely maintained balance in my cross legged position then. I managed to move my head forward at least 10 centimeters in a forward head wobble when I felt that I was about to loose my equilibrium and got a cramp in both my left foot and my side as I quickly returned to the dreaded cross-legged position. It was the beginning of a long 1,5 hour class. 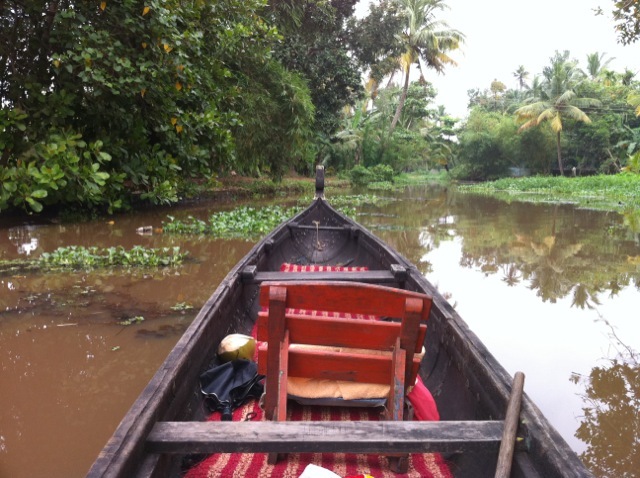 It had been heroic work: the touts at the busstation said it didn’t exist, according to the tourist office it was forbidden, but finally I was rowing on-my-own in a massive wooden canoe in the famous Kerala backwaters. The alternative had been joining a luxurious houseboat cruise or an organized tour, both are probably a lot of fun, just not for me. My persuasion tactics at the tourist office had been all over the place: my swimming skills, canoe experience on the ocean, (co) owner of two boats in canal capital Amsterdam, having lived on a houseboat for a year, even the fact that The Netherlands lies for 40% below sea level had been thrown into the pit. In the end, “ok, I’ll pay extra in order not to have somebody row me” proved to be the winning argument. Not very surprisingly, actually. The silence on the jungle river water was a pleasure to listen to. Only intermittently it was interrupted by the questions of the villagers. Invariably the first question was: “one ?” as they look amused at this stranger on his own. Despite or because of my bragging about my rowing skills, it proved to be difficult to get the boat in the right direction. I was puzzled: if the boat turns to much towards the right, you paddle a bit extra on the right and you go straight again, right? If that doesn’t work: row a bit extra. However, i seemed to be rowing against my own tide as the boat slalomed from left to right through the jungle. Suddenly, I remembered the advice a wise friend once gave me: look at a fixed point on the horizon and watch the direction and acceleration of the front of the boat compared with that point. No longer was I trying to get more power into my rowing by looking at my paddle, but i suddenly managed to prevent a lot of issues. However, I still ran to frequently into the shore for my sailor’s pride. Finally, an old lady, shouted a tip from the shore: break left! This was the exact opposite of what I was doing before (accelerate right) and it had the effect I was looking for. Only then it dawned on me that the difference between the two was that by going slower I could maneuver the boat more easily, whereas by accelerating the boat I achieved the opposite. Probably I should include these learnings into my management style. Look at the horizon and compare it constantly to the point that is moving first is a great metaphor for making sure you’re not changing to fast. Paddle less is an obvious one. And I especially like: if your organization needs to stop turning right, break left, instead of putting more effort on the right. I hadn’t eaten all day (except for some dry bread) in order to trim the rations for the germs inside my stomach. So a pleasant headache accompanied my exhaustion in kochin. My iPhone’s batteries ran down hours before, as I was thoughtfully reminded digitally that my old and new friends, family as well as my colleagues and even competitors hadn’t forgotten about me despite the untold distance between us. In a last outburst of energy I negotiated the price of room down by abusing my birthday (special price! ), something I instantly regretted as the kind grandfather and mother, who are the owners of the guesthouse, returned minutes afterwards with a plate with 3 ferrero rochers on it. My heart melted instantly, just like the chocolates. Grateful for so much kindness, I turned the fan a notch higher to hopefully enjoy a long night sleep.